The Liberty three-sport athlete will take his athletic, as well as academic talents to Yale next fall. 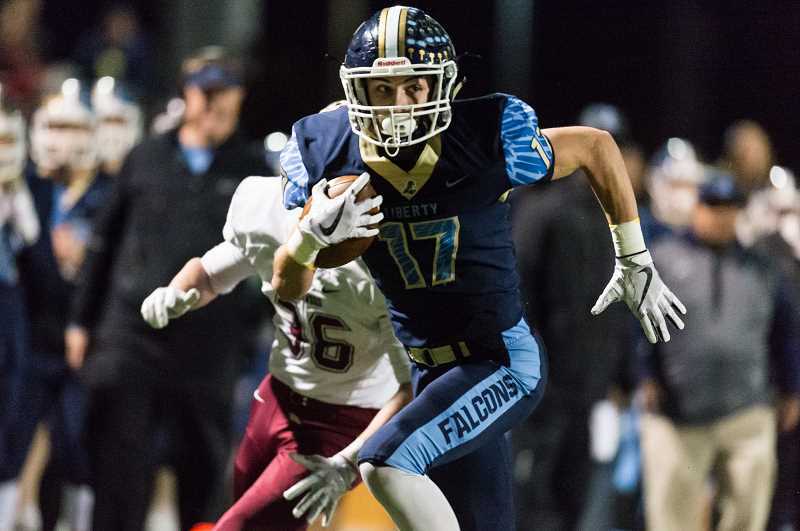 Liberty's Aidan Maloney is an All-Conference football player, All-State in track and field, and an All-American in the classroom, where he carries a 4.0 grade point average and at the top of his class. But while his actions speak loudly on the field or track, his voice is seldom heard off of it. "Aidan's kind of a man of few words, but when he talks, people listen," said Liberty head football coach Eric Mahlum. Maloney recently committed to attend and play football at Yale University. Mahlum tells a story relayed to him by the Yale coaches from one of their football camps last summer, when after receiving the Most Valuable Player award, the high school senior-to-be spent three minutes talking not about himself and the award he'd earned, but rather the importance that his family, teammates, and others in his support system hold for him, and similarly, how each and every one of the camp's attendees owe a similar debt of gratitude to the people truly responsible for much of their success. Afterward, the Yale coaches turned to each other and almost simultaneously said what they were all thinking: "That's a future captain of the Bulldogs." Ask around and you'll hear a lot of that: super kid, great leader, exceptional character. I'm reminded of an instance last fall when standing on the Liberty sidelines during a game against South Medford, Maloney stood idle while his teammates played without him for much of the first half, and I wondered why the standout running back wasn't playing. I asked a couple of Liberty constituents, all of whom were mum. I then asked school principal Greg Timmons if it was due to disciplinary action. He gave me a look of near-disgust. "No, no, not that kid," Timmons said. That was my introduction to Maloney the person, while Maloney the athlete has long been on my radar. Born and raised in Hillsboro, Maloney was the second of three kids to parents Paul and Katie. He began playing sports in the first grade, initially on the track, with help from his father, who was a high jumper at Notre Dame and helped coach at the elementary school. "Track was my first love," said Maloney. That wouldn't last long. He started playing football in the Liberty youth program in the fourth grade and quickly fell in love with the sport. "Football is my favorite sport," he said. "It provides the whole team aspect. Getting onto the field with a group of guys you trust and working towards a common goal is something special." As much as he took to the sport, the sport took to him as well. With the ball in his hands, Maloney was a natural, quick, agile and fast. He was a weapon from the beginning and seemingly became more dangerous with every passing year. But while he thrived on the field, it was the minutia of the sport beyond it that made it that much more attractive to the cerebral teenager. "For me, what I loved was the freeing feeling of competing and putting everything you have into one goal," said Maloney. "I've also always been a very competitive person, and football provided me an outlet to do that. And once you set a goal in your mind, if you can keep that in the forefront of your mind, it helps you during the times when you don't want to be there doing the work. I like that." That work ethic helped Maloney become a three-year starter on the football field at Liberty, and a decorated athlete on the track. His sophomore year, he placed second in the 110-meter hurdles and third in both the 300-meter hurdles and long jump at the state meet. His junior year, he was second in the 110 hurdles, sixth in the 300 hurdles, fourth in the high jump and fifth in the long jump. And this season? 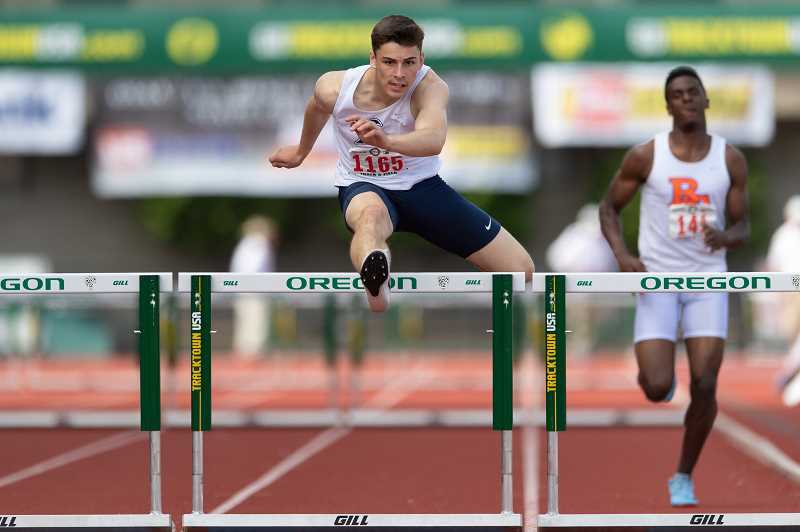 Yet to be determined, but Maloney is aiming high, knowing this is it for his tenure at the OSAA State Track and Field Championships. "I'd really like to get a win at the state track meet," said Maloney. "I've been close the last couple years, and I'd really like to win one." So what makes Maloney tick? Outsiders speak to his gifts: athleticism, intellect, a sound upbringing. 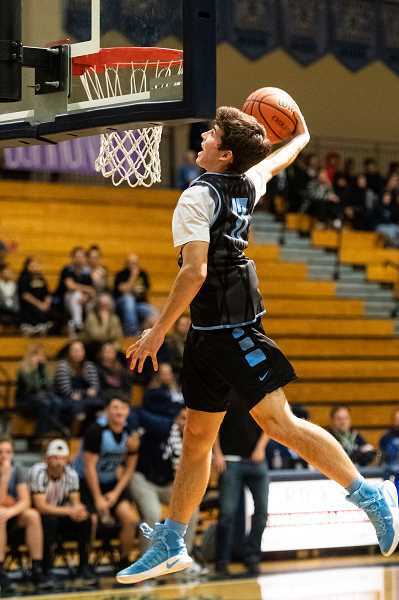 But his coaches will tell you it goes beyond talent and good fortune, and toward the skills that accentuate those same blessed attributes: work ethic, leadership and a confident aura that only rarely manifests itself by way of the spoken word. "He practices as hard as he plays, and he believes in himself," said Mahlum. "He came to compete every day in everything that he did, and that, along with that belief, is what separates Aidan from a lot of other great athletes." Mahlum told another story about a team dinner this past season prior to the Century game, where Maloney — when asked what he planned to do for his team in the game — announced in front of everyone that if the Jaguars kicked him the ball, he'd run it back for a touchdown. Liberty won the coin toss prior to the game and elected to receive. "The other coaches and I said, 'Let's see if they kick it to him,'" Mahlum said. "They did, and he returned it for a touchdown. And the same thing with Sherwood when they punted with 1:30 left. He rises to big moments, and he understands the things that turn games. He never gets down and is always positive with his teammates. That's what I love about him." Maloney takes that same approach in the classroom as well, where his parents always stressed "school before sports." "You have to have that education, and I've always approached it the same way I approached sports, keeping that end goal in mind," Maloney said. Enter Yale. The senior said he has long had an eye on the Ivy League, and especially the prestigious school in New Haven, Conn. It was the academics that originally drew him to Yale, but it was athletics that he said made it a more realistic option. Prior to stepping foot on the campus, he was already excited for the budding opportunity, but after getting his first look at it in person, there was little doubt as to where he'd be spending his college years. "It's very impressive in terms of the athletic and academic side of things," said Maloney. "I knew that before I went there, obviously, but once I got on campus and talked to some of the players and coaches, it was really clear it was a place and atmosphere I could fit into and thrive." So what will Maloney remember most about his time in Hillsboro, and specifically at Liberty High and in the Falcons' football program? First and foremost, he said, his eighth-grade championship. He said that will always stand out to him, not just because his team went undefeated, but because they did so with a lot of the same guys with whom he'll be graduating this spring. He said it's that bond that made this year's league championship and run to the state quarterfinals that much more special, and what will make his memories of his time at Liberty something to behold as he gets older. "Last month, we put the league championship banner in the gym, and that will be a pretty cool thing and something special to come back to in the future," Maloney said. Maloney isn't yet sure what he'll study at Yale, but he is interested in applying his athletic background to his interest in math and science, perhaps in sports medicine. But what he does know is the role sports have played in getting him to where he is today, and hopefully, to where he'll be down the road. "I think sports have really helped me to figure out who I am as a person, and tremendous amounts of life lessons," Maloney said. "It really teaches work ethic and constant personal improvement — trying to compete, and accepting when you do your best and it's not enough, then using that failure as motivation to get better." And how does Coach Mahlum feel about Maloney's prospects going forward? "I think he'll do great where he's going," Mahlum said. "He has the tools and the ability to compete athletically, and mentally, he has what it takes to compete. It'll be a great fit for him, and I have no doubt he'll be successful."